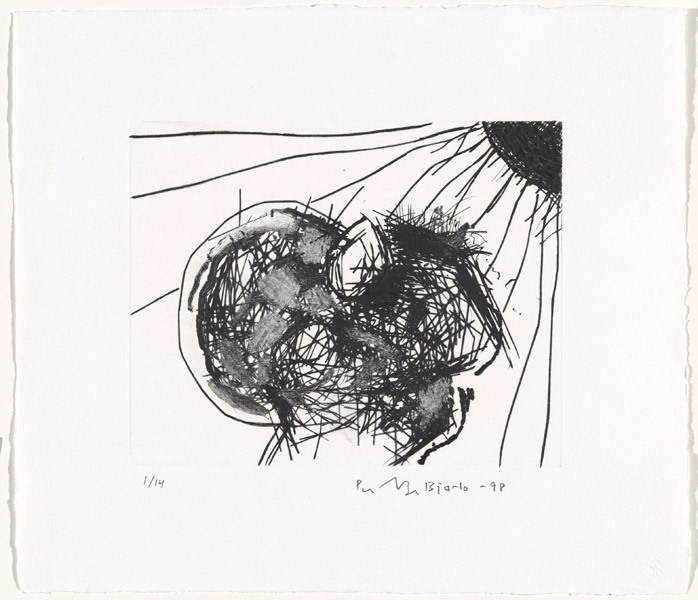 The Kenneth Tyler Printmaking Collection contains prints made by seventy seven artists. Today we are taking a closer look at the work of Norwegian artist Per Inge Bjørlo. 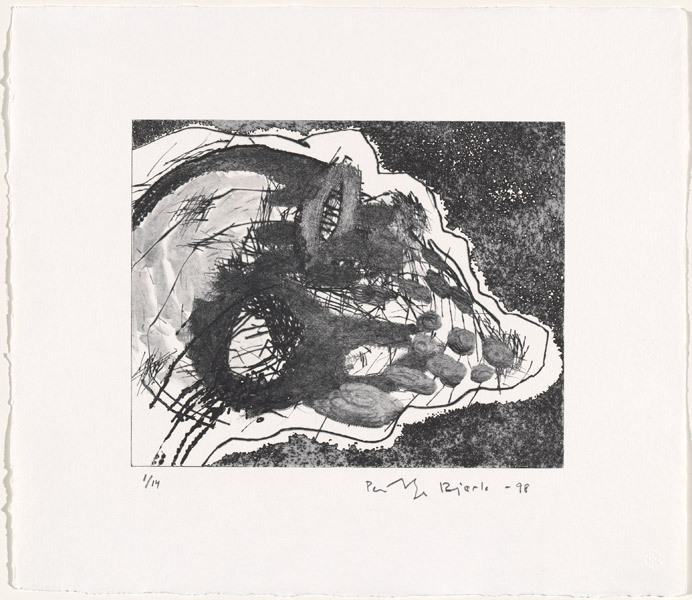 Bjørlo collaborated with Ken Tyler on several projects during the mid to late 90s, producing the series Heads from Balance and several other prints. Like much of his oeuvre – which includes painting, sculpture and installation – the work produced at Tyler Graphics Ltd. investigates the workings of the human psyche. Executed in starkly contrasting black and white with sporadic bursts of bright colour, Bjørlo’s graphic work is often highly personal. These images are from the layers of experiences and thoughts stored in my head as pictures. My difficult childhood – thepressure from social relationships, my parents, other adults. The painful sorting and searching for some images to believe in. My early years of trying to find a balance. Leaving Norway in 1969 at sixteen for New York – as with thousands of immigrants, all looking for new rooms in their heads. Ending up on the lonely prairie of South Dakota with an old bachelor herdsman as my company. Our silence together in this enormous landscape and the knowledge from his eyes that slowly led to my understanding of this life – to balance – that brought the wish of my first pictures. Pictures from my early crisis, pictures arrived from the processes of construction/deconstruction in my art. My installations (rooms) of rubber, electric light, shards of mirrors, steel and glass. Back and forth I go in the rooms in my head. Looking for the energy to my life and thoughts. 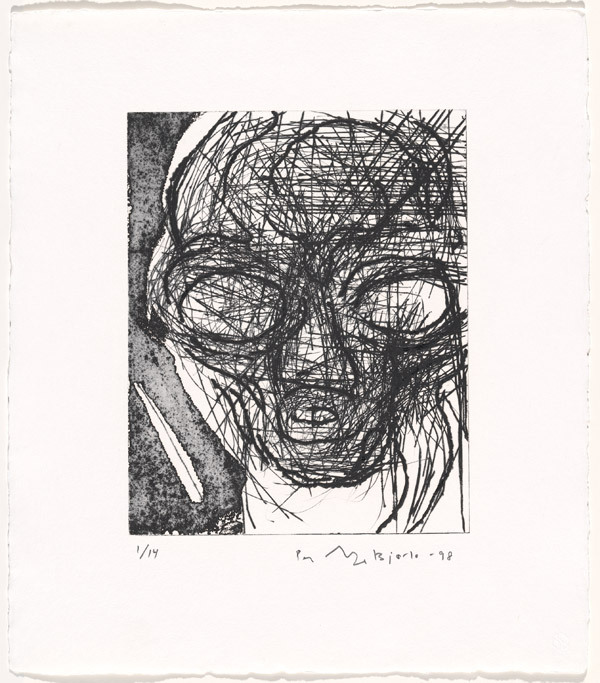 This series, Heads from Balance, comes out of the close friendship and support of Kenneth Tyler. With him I found new understanding. This first made me work the Heads from Balance out, which again released a series of paintings. Knowing art is a way of thinking – and we are all full of pictures to be sorted out. I question. My doubt and searching is in these works. I know there are deeper rooms to be reached.